Golovin created paintings, designed stage sets and objects of applied art, and illustrated books and magazines. Forty-four items in the collection are Golovin's paintings and sketches of theatre sets painted in oil, tempera and pastel on canvas and cardboard. Created, according to the inscriptions on them, from the late 1890s through to 1925, these pieces are testimony that Golovin, a superb portrait and landscape painter and stage designer with a distinct artistic vision, was a talented individual who enjoyed well-deserved fame. The array of more than 70 drawings in water-colour, gouache, ink and graphite pencil includes ordinary drawings, set and costume design sketches for theatrical productions, designs of objects of applied art, sketches of magazine covers, and illustrations to works of fiction. The museum has only one example of Golovin's efforts in the area of applied art, in which he worked productively at the end of the 19th and beginning of the 20th centuries. The Tretyakov Gallery acquired its first piece by the artist in 1895, while the Russian Museum, whose directors at that time had more conservative tastes, began to collect his work later. 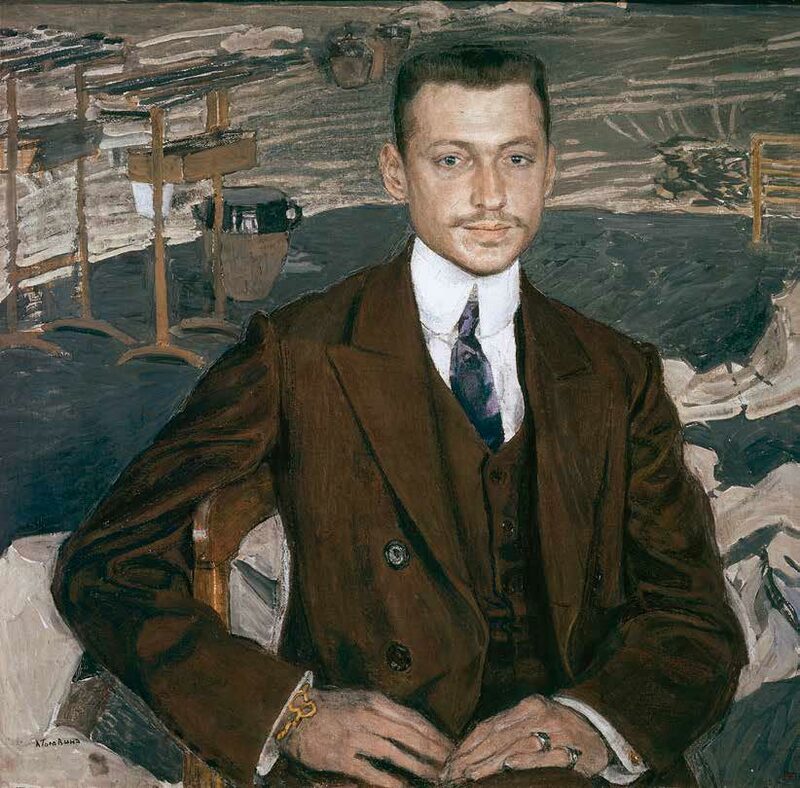 The Russian Museum's first acquisition, in 1909, was the portrait of Count Kankrin (Vladimir Kankrin); that was also the year in which Pyotr Neradovsky was appointed curator of the Russian Museum's Art Department. By then Golovin, who was born in Moscow, had been working in St. Petersburg for nearly eight years. The scandals caused by his first, innovative works in St. Petersburg theatres had faded away by then, as theatre-goers and critics alike gradually became accustomed to him and his artistic idiom - they appreciated his distinctive imagery, although continued to hurl the word "decadent" at him from time to time. 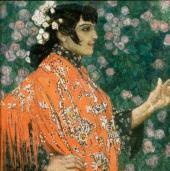 They accepted the 1908 production of Bizet's "Carmen" with Golovin's sets and costumes. At that time the artist divided his professional life between theatre and portraiture. In 1910 the Russian Museum bought from the artist all of the pieces (six set designs and 22 costume sketches) he had made in bringing to the stage, together with Vsevolod Meyerhold, Moliere's "Don Juan": the production at the Alexandrinsky Theatre sparked a great deal of debate in society. Prior to that, paintings and drawings created in the course of preparation of theatrical productions were kept only in the library of the Directorate of the Imperial Theatres and, in very rare cases, in private collections. Two years later the museum acquired the classic masterpiece of Russian art of the early 20th century, the artist's portrait of Feodor Chaliapin as Boris Godunov in Modest Mussorgsky's opera of the same name. The museum received its next large batch of Golovin's works after the nationalisation of private collections in St. Petersburg. In 1918 the museum received three set designs from Ye. Tereshchenko's collection (two for Bizet's "Carmen" and one for Mussorgsky's "Boris Godunov"). Four set designs and 15 costume sketches for Dargomyzhsky's "The Stone Guest", as well as five sketches of Tatyana's costumes for Tchaikovsky's "Eugene Onegin" were sent to the museum from the collection of Pyotr Suvchinsky, the publisher of the music magazine "Muzikalny sovremennik" (Musical Contemporary). 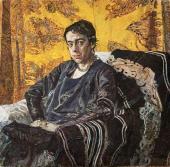 At the same time the museum received a portrait of Marina Makovskaya from her family's collection. In 1927 the Museum Fund in Moscow sent to the Russian Museum the compositions "A Spanish Woman on a Balcony" and "A Spanish Woman in Red", previously owned by Ivan Morozov. In 1928, pieces from M. Slepakova's collection - a sketch of the sets for the ballet "Jota Aragonesa" and the landscape "Autumn" - followed them. In 1937 the museum's Golovin collection was augmented again when the museum purchased from the artist's widow nine portraits and genre pieces created by him late in his life. Over the following decades the museum acquired only a few Golovin items, although every new acquisition was significant both in terms of artistic quality and the place it occupied in the great master's legacy. 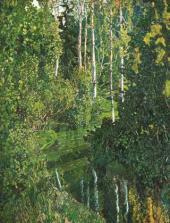 "A Pond in a Thick Forest" was sent in 1945 from the Arts Board, an arm of the Council of People's Commissars of the Russian Soviet Federative Socialist Republic; "A Spanish Woman in Green" and"A View of Detskoe Selo" came from the Leningrad Buying Commission in 1946; the landscapes "Forest" and "A River in a Forest", as well as the portraits of Fanny Sliozberg, Erich Gollerbakh and Yelizaveta Kotomina, created in the 1920s, were bought by the museum in the 1950s-1970s. 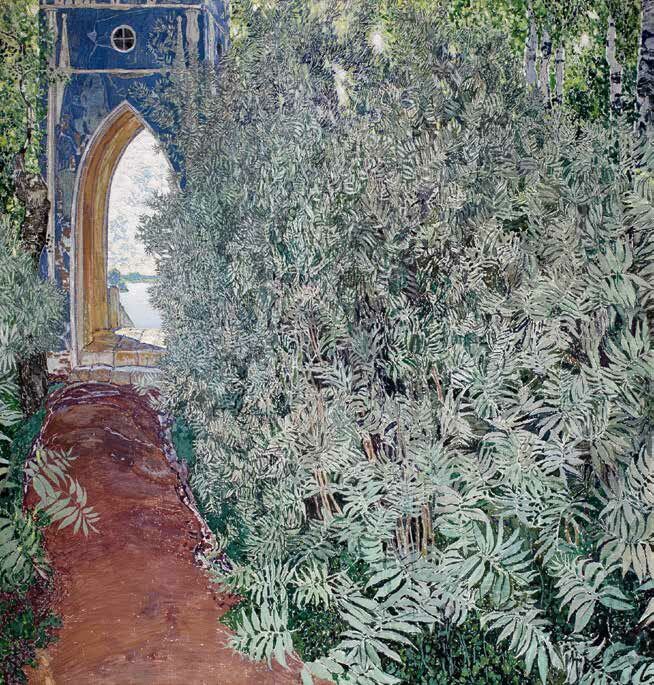 The Golovin collection received important additions in 1984-1985, such as pieces bequeathed to the Russian Museum by Leningrad collectors Grigory Levitin and the Okunevs. The latter, who were a husband and wife team, signed over to the museum sketches of the sets for opera productions such as Gluck's "The May Queen", Wagner's "Tannhauser" and Bizet's "Carmen", as well as landscape paintings and drawings. Other items important for anyone seeking a well-rounded idea of Golovin's oeuvre were the pieces from Dr. Levitin's collection: floral ornaments as well as sketches for objects of applied art and magazine covers, all created in the late 1890s, according to their inscriptions. Thanks to sheer good fortune and the focused efforts of the Russian Museum's staff, the museum now has a substantive and aesthetically unique collection of Golovin. However, what is missing are many pieces created by the artist during the first decade of his career, spent in Moscow. Over that period Golovin perfected his skills in private academies in Paris and studied in ceramics workshops in Spain, and together with Yelena Polenova shaped the Russian version of Art Nouveau in applied art. The Russian Museum does not have Golovin's portraits or symbolist paintings from that period, but it does have drafts of "Floral Ornament", "Design of a Frame for a Mirror" and "Fantastic Flowers", all created for a Russian dining-room in Maria Yakunchikova's house. The "Floral Ornament" and "Fantastic Flowers", with their elegant colour scheme and the rhythm of their shapes, are typical examples of Art Nouveau. These works are close in style to similar pieces by Polenova since both artists worked on the same project, along similar stylistic lines. The "Design of a Frame for a Mirror" is different, however - its simplified forms, bright pure colours, and folklore decorative motifs appear to be rooted in the archaic period of Russian culture. In these early Art Nouveau pieces Golovin, striving to achieve the necessary colour and texture, enriched the array of media he used, combining graphite pencil and watercolour with tempera, gouache, pastel, and bronze and aluminium paints. The same principles were applied in the design of the polychrome vase "Rooster", manufactured at the Abramtsevo ceramics workshop and now held at the Russian Museum. Neatly shaped and with a suggestive colour scheme, the vase is at the same time archaic and tantalisingly modern, aggressively masculine and elegant. If surviving photographs are to be believed, the "Rooster" looks very much like the drinking vessel (bratina) that adorned, in 1900, the "World of Art" exhibition at the museum of Baron von Stieglitz's School of Technical Drawing. The sketches for the covers of the "Mir iskusstva" (World of Art) magazine - "Angel with a Sword over a City" and "Church Domes Behind a Rampart" (from the late 1890s) - are distinguished by the artist's careful treatment of the surface of the sheet, his wish to startle, and the extreme angles which strengthen the images' expressive power. The composition of "Church Domes Behind a Rampart", with its view from above and compositional motif, is close to "Granada", the only piece in the Russian Museum's Golovin collection from the 1890s. 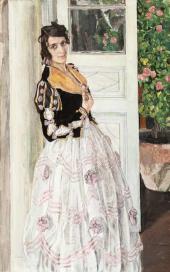 The image, created with gouache, white paints and watercolour on cardboard, is perhaps the only surviving piece produced by Golovin during his first visit to Spain. 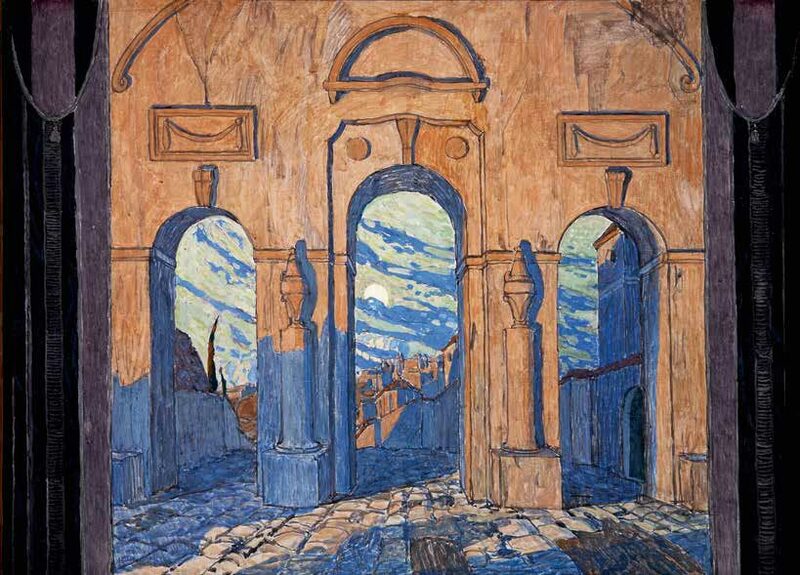 The artist was attracted not by the romantic beauty of the Arabic architecture or the busy bustle of the streets but by the distinctiveness of the imagery, the stern appearance of the monastery compound separated from the outside world. In 1900, on the recommendation of Vasily Polenov and Viktor Vasnetsov, Golovin was hired as a stage designer at the Imperial Theatres of Moscow, and in the following year he moved to St. Petersburg, where he would spend the rest of his life. The theatre reforms that he initiated were met with resistance both within and beyond the theatre world. 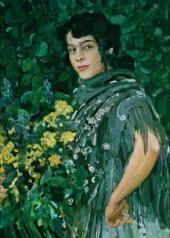 Conservative critics pursued him relentlessly, ballerinas shredded costumes that he had created, and ballet lovers caused scandals (the best-known one was related to the production of the ballet "Magic Mirror" to the music of Alexei Koreshchenko in 1903, in preparation for which Golovin created an impressionist sketch "The Forest of Dryads"). 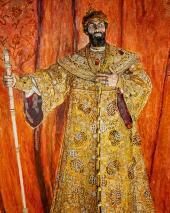 In the 1900s Golovin's theatre work to some extent influenced his paintings. Bizet's "Carmen", which it took him several years to bring to the stage, was an important milestone. Since Golovin was a reticent person, we do not know how many times during that period he visited Seville and Ronda, where, according to legend, Carmen died. 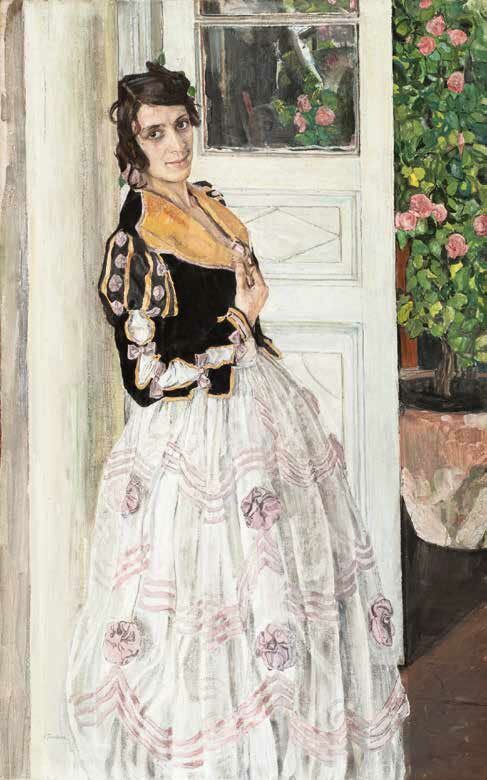 In his sets suffused with light, as well as in the elegantly assembled costumes and their carefully matched combinations and contrasts, Golovin strove to convey the "real Spain", its spirit, character and colour. The sketches "A Street in Seville" and "Lillas Pastia's Tavern" are evidence of this; Golovin's vision of Spain's spirit is also conveyed in his series of costumed portraits "Spanish Women" - some of them stately, some simple-looking, some outgoing and full of life, some mysterious and unapproachable. The artist transformed the appearances of the women who worked in the Imperial Theatres' workshops, in each portrait coming up with a composition fitting the sitter's individuality. 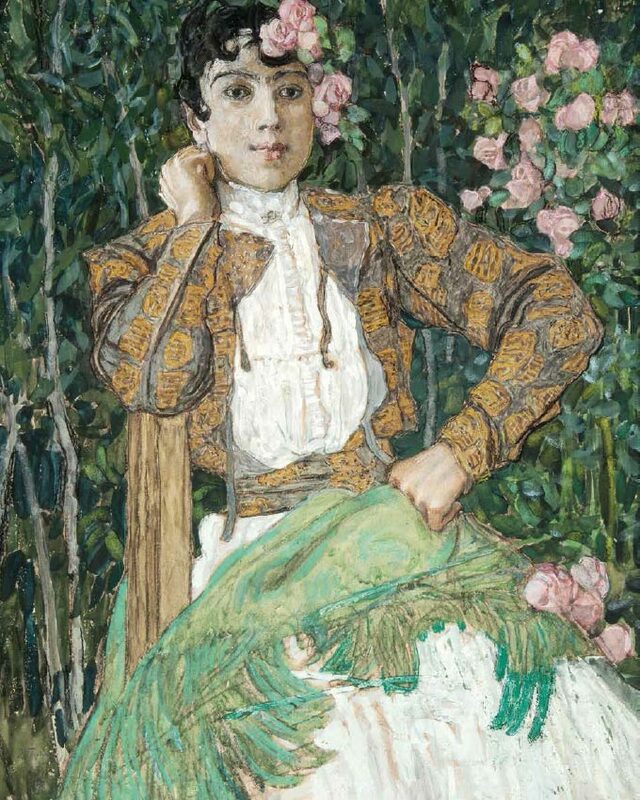 The women's figures in clothes designed by Golovin make for a compelling and distinctive sight against the background of thick foliage, sometimes enlivened with softly glimmering flowers. In 1911 the series of Spanish female images was complemented with a breathtakingly beautiful composition "A Spanish Woman on a Balcony". Not exactly beautiful, the woman portrayed catches the eye with her gracefulness and a calm sadness in her eyes. Her slim figure is fascinating against the whiteness of the pillar and the door, the structural details of which highlight the modest elegance of the woman's plain dress. A lavishly blooming rose bush in the background strengthens the lyrical theme. In 1910 Golovin continued to tackle Spanish themes, as reflected in his theatre works as well as in two pieces unusual for his oeuvre, "Feast in Spain" and "A Spanish Peasant Woman". These two "sketched ideas", not fully finished, look like fragments of large compositions or even frescoes. "Feast in Spain" is the sketch of a painting featuring, uncharacteristically for Golovin, many human figures and an impressive impressionist fragmentary composition. Although the figures in the middle are layered one over another, the image is captivating and eye-catching. It features imperturbable macho men and romantic, fiery women with magnetic eyes, as well as bullfighters on horses acclaimed by the crowds. This is an image of Spain as a country of passions and mass spectacles. Another piece, also featuring a motif unusual for the artist, is the big painting "A Spanish Peasant Woman", showing its subject in a beckoning pose. The meaning of the image is less clear than that of "Feast in Spain": featuring contrasts between light and dark colours, it is full of gloomy energy. The first two decades of the century saw the blossoming of Golovin's talent for portraiture: he created a large number of images of Russian intellectuals - poets, artists, actors, as well as employees of different departments of the Imperial Theatres. The Russian Museum has a picture from this series, a waist-length image of Count Kankrin (Vladimir Kankrin), an important official at the Directorate of the Imperial Theatres (from 1909). The figure of a serious young man, in the foreground of the composition on a quadrangular piece of canvas, makes for an impressive silhouette against the backdrop of Golovin's studio under the eaves of the Mariinsky Theatre, which is pictured from above. An example of an Art Nouveau painting, this portrait has a strong decorative quality in its colour scheme and composition, the function of the silhouettes "rhymes" between the shapes of numerous objects filling the space. 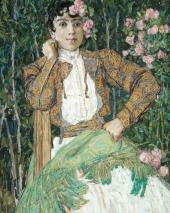 The portrait of Marina Makovskaya, with her svelte figure, in an elegant dress with a delicate rose at the waistband, appears to have been created in the same studio, against the backdrop of a blue-green stage set. This is one of Golovin's best full-dress portraits, an example of his distinctive style and his understanding of the objectives of portraiture. From 1905 onwards the great Feodor Chaliapin, too, posed for Golovin in different stage costumes in the same studio. 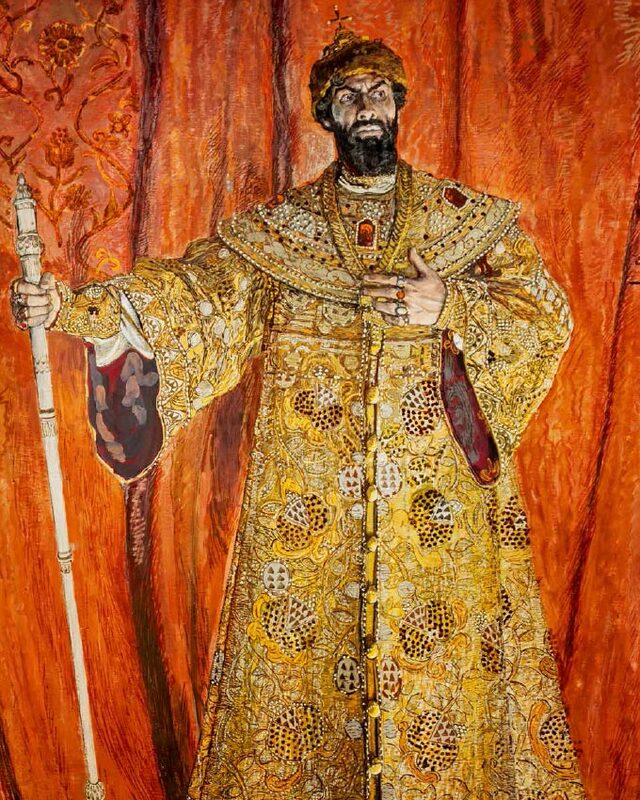 The Russian Museum holds the most important of these pieces: the splendidly painted image of Chaliapin as Boris Godunov in Mussorgsky's opera of the same name (from 1912). The Mariinsky production of the opera, in 1911, was not successful, however: the cast of extras was not up to the task of representing an ancient chorus as Meyerhold wished, Chaliapin demanded to change several important elements in the director's script, and at the first performance Chaliapin and the chorus genuflected before the box where the Tsar was sitting - an episode that made history. In the late 1900s and early 1910s the artist took up still-life and landscape painting. Regrettably, the Russian Museum does not have any of his still-lifes, although it has a number of his landscapes. Like portraits, the landscapes are Art Nouveau pieces with a strong decorative quality. 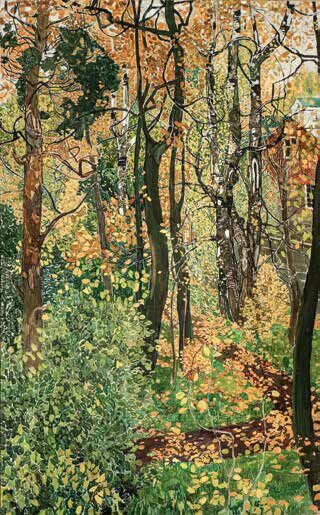 Golovin loved to paint old and neglected parks with pavilions and summerhouses tucked away here and there amid lush verdure. His paintings evidence a nostalgia for an irrevocably lost past and the destruction of its monuments. Golovin relishes the beauty of the perennially regenerating nature and human forms. He is also fond of thick forests and parks growing wild, sometimes with small lakes gleaming through the dense lacework of the boughs. His pieces, distinguished by delicacy of sentiments and great artistry, feature skilfully "rhymed" lighted and shadowed objects, nuances of colours, and a complex pattern of contours. 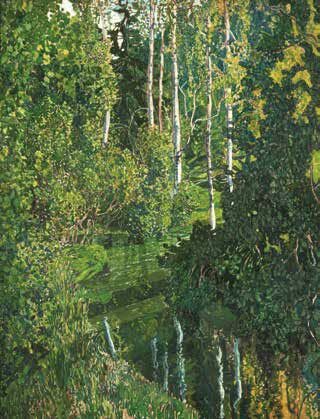 Golovin's "thickets" are never monotonous because his compositions feature different settings and represent nature at different hours of the day and in different states. In the years up to 1917 Golovin and Meyerhold created their best co-productions at the Alexandrinsky and Mariinsky theatres. After exploring in "Carmen" and "Boris Godunov" his original idea of colour accompaniment, Golovin was interested in Meyerhold's concept of "traditional theatre", which the director saw at that time as the opposite of a theatre of psychological realism. The 1910 production of Moliere's comedy "Don Juan" at the Alexandrinsky caused considerable discussions among theatre lovers. The director and the artist chose Louis XIV's baroque residence as the setting for the action, and the forestage was extended deep into the auditorium, which was illuminated throughout the performance. The production stunned viewers with its imaginative theatricality and the beauty of gesticulation. The dynamics of the performance, the actors' gestures and movements, the changes of sets, the combinations and colour scheme of the forms - everything ran to a single rhythm. Alexandre Benois, who saw in the production only admiration for the past without any connection to contemporary life, published in the newspaper "Rech" an article "A Ballet at the [Alexandrinsky Theatre]"1. The artist and the director again tried synthesis of music and gesture in 1911 - this time, in music theatre, staging Gluck's opera "Orpheus and Eurydice". The scenic design, theatrical style and acting - everything was governed by music, while the singing was accompanied with dance and pantomime. 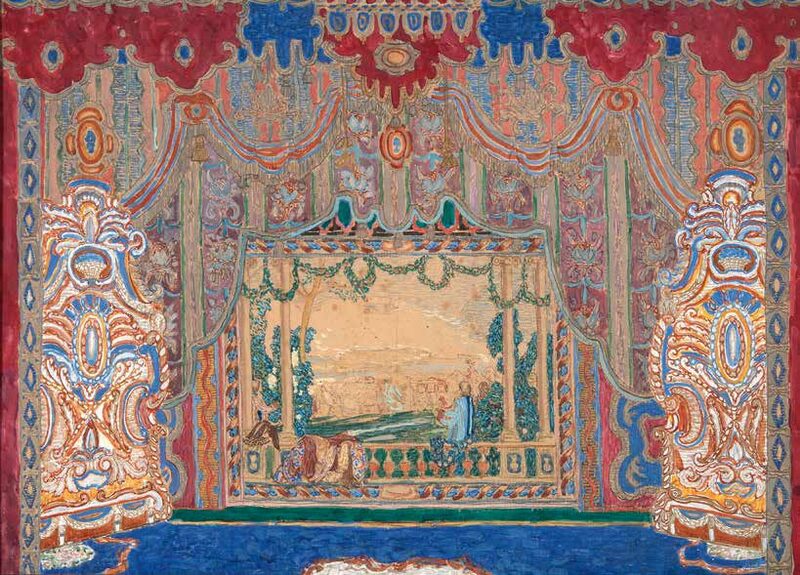 Later, already in the Soviet period, Golovin designed at the Mariinsky another Gluck opera, "The May Queen", in 1919. The refined elegance of the production stood out in astonishing contrast to life outside the theatre. Earlier, shortly before the February Revolution in 1917, Golovin and Meyerhold brought to the stage one of the finest productions they ever made together, Dargomyzhsky's opera"The Stone Guest" at the Mariinsky. The austere and solemn design of the performance had a strictly symmetrical composition and abstract colour scheme. The emotional tenor of the performance was set by ornamental patterns - their rhythms and the alternations between dark and light areas, played out like music, were mournful and solemn, as well as suggestive of the hero's imminent death. 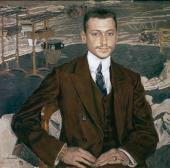 In the 1920s Golovin did relatively little work for the theatre, driven away from the stage by the Constructivists. Many of his projects, such as "Eugene Onegin" at the Odessa Opera (1925), which left a legacy of several sketches, remained unrealised. During those years, when the artist's family experienced financial hardship, he concentrated on "pure" painting, designing concert programmes, and illustrating works of fiction. His landscapes, like "Autumn" and "A View of Detskoe Selo", were refined and poetic as before. 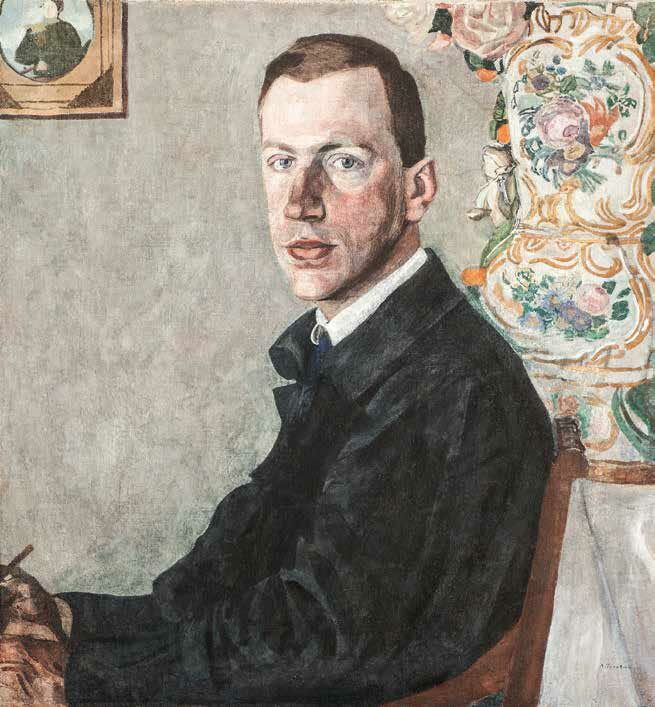 He continued to produce images of personalities from the theatre world and academia: the actors N. Yefimov and N. Kalinina, the art scholar Erich Gollerbakh, the gallery owner Nadezhda Dobychina and others. Both the intimate and the full-dress, full-length portraits have a theatrical streak: the compositions are carefully thought-out and showy, the sitters assuming "evocative" poses. The combinations of and contrasts between various expensive and elegant fabrics, as well as the fabric designs have an important emotional value. In the Dobychina portrait the splendour of the decor highlights the woman's inner drama. The artist worked relentlessly until his last days and the aesthetic quality of his art never deteriorated. Benois, Alexandre. “A Ballet at the [Alexandrinsky Theatre]”. In: “Rech”. 1910. November 19. Set design for Molière’s “Don Juan” at the Alexandrinsky Theatre in 1910. Set design for Dargomyzhsky’s opera “The Stone Guest” at the Mariinsky Theatre in 1917. Act 2.